The European luxury hotel — Royal Grace Hotel Optics Valley Wuhan (Wuhan Guanggu Huangjia Geleisi Dajiudian) is built with international 5-star hotel standards in mind, and is in the heart of the China Optic Valley of Wuhan which is located on the south end of Guan Shan Da Dao, Wuchang. It is only 50 minutes away from Tianhe International Airport. There are 223 guest rooms in Royal Grace Hotel Optics Valley Wuhan, such as the Presidential Suite, Royal Suite, Deluxe Room, Superior Room and Executive Floor, as well as the European-style furniture, and panoramic views of the outdoor royal garden landscape. The quality chefs of the Gourmet Chinese Restaurant have chosen ingredients to meticulously craft the variety of cuisines from around China in an authentic manner. The Manna Western Restaurant is based around the concept of an aristocratic private kitchen with a Southern Italian style. Red Lion Pub is decorated in a traditional English style. There are two grand ballrooms, the Grace Ballroom and the Florence Hall, as well as several other multi-functional halls in the hotel equipped with LED screens, advanced sound and lighting facilities. In addition, the Royal Grace Spa Club, gym, and bar will ensure that you have relaxing ways to spend your time when not being pampered in your room. 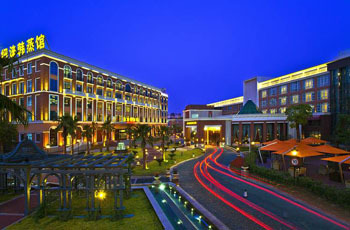 The hotel is managed by HK Grace International Hotel Management Co. Ltd.